So Christmas Day 2013 saw me take some photos for my first proper outfit post, this is a very nerve wrecking thing for me, as I'm not the most fashionable nor very body confident! But its something I've always been interested in, I always feel inspired to do outfit posts when I read Megan's Blog! So I thought I'd give it a go, a new year and all that so hopefully it will be the first of many! 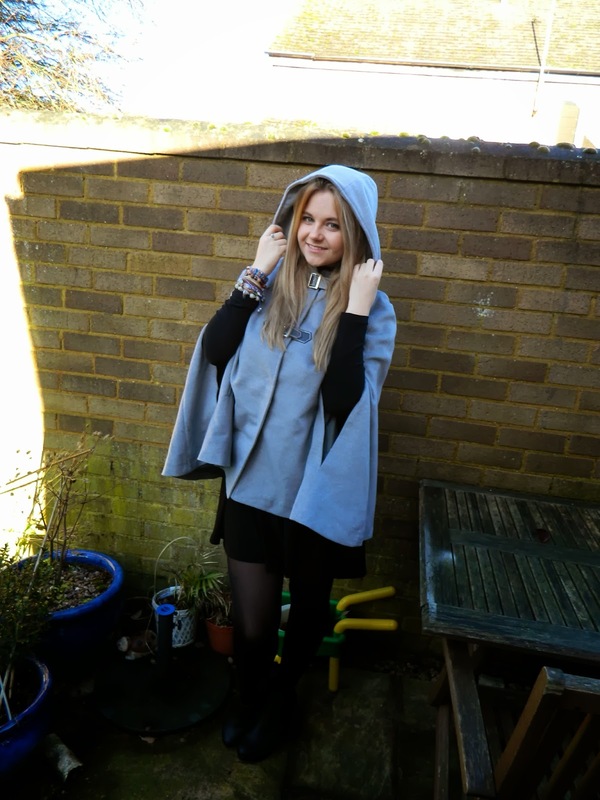 I've been on a hunt for a coat for winter for quite a while, but didn't really want just a standard coat, so when I saw this Cape on LightInTheBox I pretty much fell in love! When I wear it I literally feel like I'm in a fairytale…and who doesn't want that? I really love this dress from ASOS, its very simple & I feel like it will go with many things and can be dressed up and dressed down! I love a multi-purpose outfit I do. The high neck lace insert jazzes up this simple dress and takes it from Day to Night! I know I will get lots of wear out of this dress. For this particular outfit choice I wore black heeled ankle boots, but for a more casual look I'd pair it with black pumps or for a night out I'd wear black heels or wedges. So here we have my first outfit post, how did I do? Do you dress up for Christmas or are you a Pjs wearer? Would you ever try a cape? The cape is to die for!